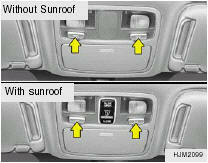 In the "DOOR" position, the interior courtesy light comes on when any door is opened regardless of the ignition key position. The light goes out after 30 seconds if the door is closed. When a door is unlocked by the transmitter, the interior light stays on for 30 seconds as long as the door is not opened.